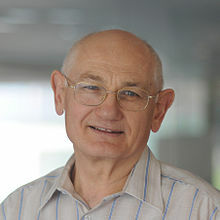 Mordehai (Moti) Milgrom (born 1946) is an Israeli astrophysicist, known for his proposal of Modified Newtonian dynamics (MOND). It seems to me that in understanding MOND and its fundamentals we have only scratched the surface. If the developments of quantum mechanics and relativity are any lesson here, departures of such magnitude from long- and well-tested physics may bring with them completely new concepts, not summarized by mere modifications of the governing actions or the equations of motion. MOND may also turn out to bring in concepts that are presently beyond our ken (as hinted perhaps by the cosmological connotations of a0). Mordehai Milgrom (30 Apr 2014, updated 31 Aug 2014). "MOND Theory": p. 5. Mordehai Milgrom (Aug 2002). "Does Dark Matter Really Exist?". Scientific American. Of all of the many mysteries of modern astronomy, none is more vexing than the nature of dark matter... This dark matter has eluded every effort by astronomers and physicists to bring it out of the shadows. A handful of us suspect that it might not really exist, and others are beginning to consider this possibility seriously. Mordehai Milgrom interviewed by Michael Szpir (Jan.–Feb. 2003). "Dark Matter Heretic". American Scientist. What makes MOND particularly intriguing is that it predicted many effects that could not even be tested when I formulated it. I did encounter much opposition and sheer disregard, and this was against my expectation. I was surprised that people thought that this was not a legitimate avenue to explore. Many times I heard people say that it is too early to start considering such heretical ideas. Why? I wondered. I thought it was legitimate to consider anything. The nice thing is that MOND has not had to change or adjust itself to the many observations that came after it was proposed. … In the end, the process that might sway people's minds could be a slow one, in which they become disillusioned and dissatisfied with DM, while MOND explains more and more of the observations. And, if MOND does turn out to have some truth to it, the fact that it encountered so much opposition will just show how nontrivial a thought it was. Mordehai Milgrom interviewed by Oded Carmeli (Feb. 2017). "The Physicist Who Denies that Dark Matter Exists". Nautilus. What struck me was some regularity in the anomaly. The rotational velocities were not just larger than expected, they became constant with radius. Why? Sure, if there was dark matter, the speed of stars would be greater, but the rotation curves, meaning the rotational speed drawn as a function of the radius, could still go up and down depending on its distribution. But they didn't. That really struck me as odd. So, in 1980, I went on my Sabbatical in the Institute for Advance Studies in Princeton with the following hunch: If the rotational speeds are constant, then perhaps we’re looking at a new law of nature. If Newtonian physics can’t predict the fixed curves, perhaps we should fix Newton, instead of making up a whole new class of matter just to fit our measurements. This page was last edited on 17 February 2018, at 20:53.